This is a wonderful daycare & I can't recommend it enough. The teachers are amazing and genuinely love the children. They are constantly busy, make firm friendships and I love how structured it is - preparing the kids for school. The food is amazing, the rooms are clean & tidy and best of all, I love that I can pop in during the day and watch what is happening in the room. This Centre is simply fantastic!! Taha absolutely loved being here and he's going to miss the teachers and all his friends. My son Liko went to ABC childcare for 4.5 years, starting as young as 6 month old. When I chose ABC, it was Eva's personality that convinced me to have my son at ABC. She is so friendly and has a lot of common sense; I knew Liko would be loved and well looked after, learn a lot and be happy there. Eva was always very easy and accommodating with my changing work arrangements, so I could bring Liko in whenever I wanted or needed an extra day, although he only had 2 regular days. It made life so much easier for me! Liko learned so much there, also everything I failed to teach him, good manners, eating properly, tidying up... he got very well prepared for school. Most important, my son loved to go to the Centre and he never wanted to leave until the very end, so I also got to enjoy the last 20 minutes of watching Eva with the kids on her lap reading books. And the food! With my very hungry kid I found it very important to know that he would get a healthy hearty home-cooked meal and also healthy snacks every day. Liko always tells me he wants to visit you, we both miss the good times when he went to ABC Childcare. As Victor is turning five, he will no longer need the wonderful services of ABC Childcare. We plan to have him spend his birthday (Tuesday 17th) at ABC, then he start schools the following day. Eva, your kindness and creativity are outstanding. You have always held high expectations of the children, created firm boundaries for them, and kept a sense of humour and perspective about their ups and downs. Victor has bonded with all your staff, with a special place in his heart for Suha. 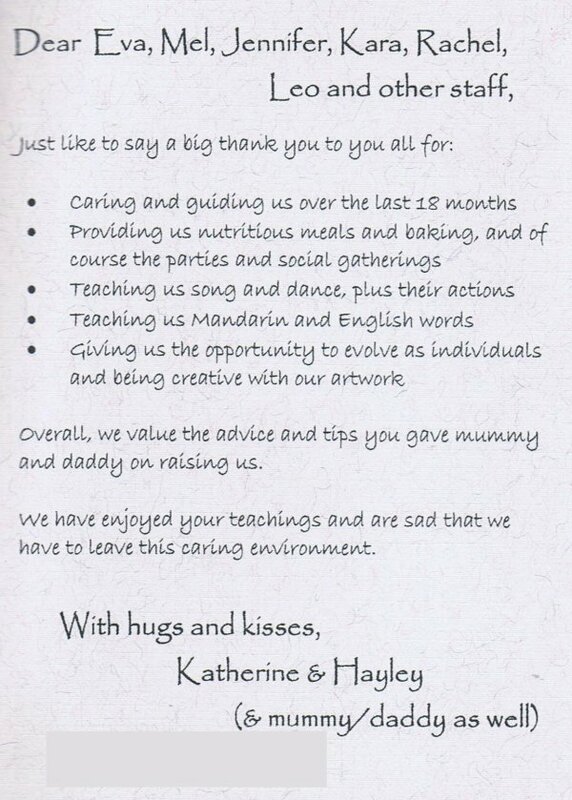 It has been a pleasure sharing our children Herbert, Tabitha and Victor's milestones with you (since 2007!). I want to write to tell you all how much Jack, Ollie and I are going to miss you, and that we think you're all truly wonderful! With so much change in my and my boys' lives over the last year, it's been a huge relief knowing that I've been dropping Jack and Ollie off to a place where they felt safe, cared for and happy. The environment you provide is supportive and stimulating, and I believe the personalities that have begun to shine in the boys is owing to each and every one of you and your lovely natures. I've known they've been very happy because the feedback I get from them has only ever been positive. You can be assured that we will all miss you hugely. We look forward to keeping in touch, and visiting when we can. And, likewise, please get in touch if you're ever up our way. It would be my pleasure to recommend you to anyone who is wanting a fantastic ECE Centre for their child. I would like to take this opportunity to thank you for the care of our youngest child over the past eighteen months. As a mother of six, who has been a stay at home mum for 19 plus years it was a huge decision to place our "autumn leaf" in childcare at eighteen months old. Ezekiel needed care for three and a half days a week so I could study. The shoe was placed on the other foot as I myself had been a nanny for several different families and was quite particular about how the job should be done. I also wanted a place that was close to the city and that pick up and drop off wouldn't be too difficult. ABC childcare fitted perfectly and far exceeded my expectations. Without exception all the staff are wonderful, caring and sensible people, who obviously have a calling to love and care for little ones. This also included several children with special needs that attended over the time Ezekiel was enrolled. It was lovely to leave him in an environment that was so inclusive with a richness and warmth gained from a real sense of belonging. The children were very happy and behaved extremely well; this was due to the vast experience of the teachers. And the food... how wonderful it was to deliver Ezekiel without the hassle of organising his meals and come in to the smell of cooking, making the place very inviting and homely. I would often arrive to see children eating breakfast and some on their third helping! This gave me piece of mind knowing that if he was too tired to eat all his dinner I knew he had already had at least one main meal at lunch time! I sorely miss all the great gals and couldn't recommend highly enough to anyone looking for a "home away from home" for their most precious. As the name suggests it is Absolute Best Baby and Childcare! My husband was supposed to have called you about 6 weeks ago to let you know that we were putting Sam in another daycare center, Obviously he didn't and I (and he) apologise for any inconvenience caused. We are trying to buy a house out Kilbernie way and have put Sam in a center over in the suburbs anticipating moving later in the year or early next year. We don't want to have to move him when we move as we want him to feel settled etc. We loved your center. The kids were so happy and their smiling faces made our day. (We had looked at a few centers where the kids were not so well cared for.) If by chance we can afford a home over Northland way we will discuss transferring Sam to your care if that is okay with you. Again, sorry that we did not let you know earlier. My daughter Marie-Claire has attended ABC Child Care since she was one and a half years old, and she is now nearly five and ready for school. Over three plus years ABC has played a key role in nurturing her as a strong, confident child. In the mornings she skips down the path to ABC filled with enthusiasm for the day ahead. Some afternoons we walk home and she tells me how she loves her caregivers, naming each in turn. I too have felt that they all are loving towards her. Marie-Claire has had a good basic preschool education at ABC. She has also learned how to fit into sensible routines and rules and eat a wide range of healthy food. She has gained excellent socializing skills, and to relate warmly to people regardless of age or race, a vital skill for the NZ of the future. If we had a younger child, I would not hesitate to use ABC. It’s a place where children come first. I spent quite a few months looking for the right care giver who valued the same principals and morals as I did in relation to bringing up children. I knew within weeks I had found a needle in the haystack. My boys are now 6 and 5. ABC Childcare Centre has provided childcare for my oldest son since he was 3 months old (March 2006), and for the youngest since he was 3 months old (January 2008). My sons have felt completely safe and secure in ABC's care since day one. For example, when my sons struggled with some separation anxiety at drop off; ABC Childcare Centre were always supportive, and helped to come up with ways to ward off the tears, and make drop offs easier for my sons and for me. It didn't take my sons or me long to realise that they were in very safe hands. What I respect most about ABC Childcare Centre's child care was how they understand that, with every child entering their childcare, the family values and beliefs that they are learning at home come with them. ABC Childcare Centre's staff have always exhibited patience and kindness when working with children. By modeling this behavior, they are able to teach the children how to interact respectfully with one another. When conflicts did arise, they always remained calm, and helped the children work through their differences, teaching them how to work, play, and problem solve together. This is important to me as the children spend so much of their day within the facility and interacting with peers and other adults. ABC Childcare Centre offered various educational activities as well as healthy snacks and home-cooked meals. The facility is always clean and kept child proof. When my second child was born, I had no hesitation at all leaving my infant with ABC Childcare Centre. We had been able to watch the way ABC Childcare Centre interacted with children of all ages, and I knew that my newborn would be in very safe, nurturing hands while I was at work. There is nothing harder than leaving your newborn in someone else's care, and ABC Childcare Centre made the transition so much easier for our family. It was with great sadness that my sons have left ABC's child care. They are both now in the formal education system, and without ABC Childcare Centre's early education facility, I believe the transition into the schooling system would have been so much more of a struggle for both of them. They have settled into the routine of school life without blinking an eye, and both are personable, settled and remarkable little people with big futures, thanks to the compassionate, dedicated and creative care afforded them in their first 5 years of life. While we were very sad to leave, we were also grateful for the years we were able to spend with ABC Childcare Centre. It is with great ease that I would recommend ABC Childcare Centre as a child care provider for any other family in need of child care services. They can most certainly offer everything a family would be looking for in a provider. I would have no hesitation recommending Absolute Baby and Childcare (ABC Childcare Centre) as the best place to send your child. My daughter has been enrolled at this Centre from 1 year old to 5 years old. It has been exciting to see her grow and develop over the years, and I acknowledge the contribution ABC Childcare Centre has made to her progress. I had originally enrolled my daughter in another day care from when she was 7 months until 1 year, but moved her to ABC Childcare Centre as the other centre was just not meeting her needs, or my expectations (inexperienced staff, high turnover, and focal points appeared to be things other than what's best for the kids). I have found ABC Childcare Centre to be more like an extended family than a business. It is well managed by Eva Brodie and the children are fed nutritious home-made meals every day. The staff are very loyal, committed, capable, approachable and caring and turnover is very low, meaning a stable, consistent environment for your child which is conducive to their learning and development. Eva is also very experienced and good at picking up on any extra needs of your child and bringing this to your attention. The staff are very good at keeping each family informed of development and what's been happening with their children - not only at parent-teacher interviews, and through stories in progress books, but also via conversation on any day throughout the year. Eva has a heart of gold and is obviously in the business of childcare for the right reasons -all for the wellbeing of the kids and their family, and this permeates throughout the Centre she owns and manages. I would like to take this opportunity to let you know how wonderful it was to a child from ABC Childcare Centre start at our school. Jena's transition to the school environment was a smooth and successful time. Jena is a confident, adaptable and independent 5 year old, well ready and prepared to start the next stage of her education. Jena has obviously spent time at her preschool learning how to play cooperatively, think independently and to problem solve. Her literacy and numeracy skills were well established and from this she has continued to develop and increase her skill and confidence in these critical areas. Jena came to school with good social skills and an awareness of other people and their needs. She often talks about her time at her childcare centre with great fondness. Thank you for all the wonderful work and experiences you provided for Jena at Preschool, all of which has set her up for a successful and confident start to school. Deputy Principal and Year 1 teacher.